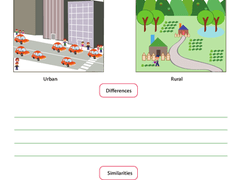 Kids think about the similarities and differences between rural and urban life on this worksheet. You all have noses and arms and fingernails, but what makes you different? Calling all explorers and map-makers! This geography worksheet is a perfect introduction to longitude and latitude. Get comfortable with longitude and latitude with this map worksheet. Kids will find cities in Hawaii using labeled columns and rows. This longitude and latitude worksheet challenges kids to find the locations of cities on a map. Practice geography with this longitude and latitude worksheet. Use this worksheet to identify the capital of Daman and Diu and get some extra cursive practice in! Calling all explorers and map-makers! Help your third grader find the coordinates to cities on the map of Utah. Give your child a fun review of longitude and latitude with this fun detective activity! She'll hunt down a wanted criminal using the coordinates given. What Are Goods and Services? Here is a great opportunity to talk with your child about goods and services. She'll read the definitions and come up with a few examples of each. Your child will learn the difference between goods and services in this fun intro to economics worksheet. Your child will practice writing the two capitals of Jammu and Kashmir with this worksheet's double dose of fun. Try this Lewis and Clark coloring page for your adventure-loving kid! Your beginning geography student can practice using coordinates to find a city on a map with this intro to latitude and longitude worksheet. This coloring page depicts a unicorn and a girl riding on its back. Use this girl and her unicorn coloring page in a lesson about mythological creatures. This geography worksheet will help introduce your child to longitude and latitude with a simple grid. Use the grid system to find cities in New York state. Here is a fun way to introduce your child to latitude and longitude. She'll get to go on a quest to look for an infamous cat burglar using coordinates. Help your children practice writing in a faster form by writing the capital of the Andaman and Nicobar Islands! Help your child find out more about what life was like for parents and grandparents growing up with this genealogy interview page. Use this worksheet to practice identifying India's different states, union territories, and capitals. Give your child this worksheet to practice writing Indian union territories' capitals in cursive. This reading exercise helps kids understand the difference between cities and small towns, and helps them grasp concepts about communities and relationships. Your kid will find 10 European country names, build her geography vocabulary, and learn about the countries from Andorra and Switzerland to Estonia and Finland. In this worksheet, kids will explore the similarities and differences between cities and towns.